Examination of the skin remains a discipline that relies heavily on the basic clinical skills of vision and touch. If this information is combined with the practitioner's knowledge of the disease process, the correct diagnosis can be determined with a minimum of expensive laboratory testing. The dermatologist usually orders labwork to confirm a diagnosis or to stage the disease process rather than using it to seek a diagnosis. After all, the disease process is evolving before your eyes. In addition to the standard testing that is done to support or confirm a clinical diagnosis, there are certain special tests that are common in a dermatologic evaluation. 1. Potassium hydroxide exam (KOH test). 3. Ectoparasite exam (scabies preparation). A 25-year-old woman requests evaluation for symmetric white macules and patches on her neck and upper torso. She has recently read about vitiligo on the internet and is terrified of permanent disfigurement. Examination reveals oval thumbprint-size white macules and larger confluent patches with smooth margins. Gentle scraping of a lesion raises a loose white scale. 1. Would a KOH examination be of value for this patient, and if so, why? 2. Would a Tzanck preparation be of any value for this patient, and if so, why? 3. Would biopsy be of any value for this patient, and if so, why? A patient presents with an irregular erythematous scaling patch 1.7 cm in size on the dorsum of the right foot extending into the first interdigital web. The lesion has been present for 2 years, has gradually enlarged, and itches occasionally. In addition to the other features, examination reveals a thready, slightly raised, translucent margin. 4. Would a KOH examination be of value for this patient, and if so, why? 5. Would biopsy be of any value for this patient, and if so, why? with alcohol and scale is gently scraped from the advancing edge of the lesion, or in the case of a vesicular tinea, an inverted blister roof makes an excellent specimen. The scale or inverted blister roof is placed on a glass microscope slide and a cover slip is placed on top. Using the edge of the cover slip for capillary action, 20% potassium hydroxide solution with 37% DMSO is slowly flooded around the scale. The specimen is then gently heated over an alcohol lamp short of the boiling point. Gentle compression on the cover slip over the scale (smashing) will distribute the solution and speed clearing of the specimen. Within 3 to 5 minutes most specimens can be read. 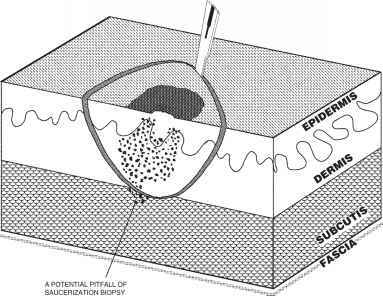 The degree of separation of the epidermal cells will tell you if adequate clearing has occurred. Experience is essential for reliable reading of a KOH skin preparation. Today, the average clinical laboratory lacks personnel who are adept at this exam. It is best for the practitioner to personally acquire this skill. Prior treatment with topical antifungals or even a small amount of ointment base on the area can cause a false-negative exam. 1. Dermatophyte fungi will show long or short branched hyphae, depending on the organism (see Photo 50). 2. In tinea versicolor, the hyphae are plump, short, and not branched. In addition, clusters of round spores like grapes on a vine are also present (see Photo 51). 3. Candida will show short pseudohyphae and round spores, with and without budding (see Photo 52). This simple test can give a very rapid confirmation of the presence of infection by either herpes simplex or herpes zoster (varicella) virus. A typical fresh blister is gently unroofed and the blister base is scraped short of producing bleeding. The material obtained is smeared on a glass microscope slide and is stained with giemsa, toluidine blue, or Wright's stain. A positive smear will show epidermal keratinocytes with ballooning nuclei (a marked increase of nuclear-to-cytoplasmic ratio), and large syncytial multinucleated giant cells (most characteristic) (see Photo 53). Although this confirms the presence of a herpetic infection, it cannot distinguish one herpesvirus from the other. 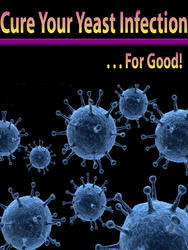 Other viruses have been occasionally reported to have positive findings on Tzanck preparation, and it has also been used in the initial evaluation of certain of the major blistering diseases. These are beyond the scope of this book. This test is done in the same way as the KOH exam. Look for track lesions or early blisters around the fingers, wrists, or ankles. Scrape or very superficially shave them. The slide should be examined in its entirety for the presence of adult mites, nymphs, ova, or egg casings (see Photo 54). Any of these elements confirms the diagnosis. 1. As a diagnostic tool for a lesion or an eruption that is vexing to the practitioner. 2. To confirm a clinical impression. 3. To stage a tumor and therefore determine how aggressive the surgical approach needs to be. 4. To confirm what was already removed. Whenever tissue is excised, it should be submitted for microscopic confirmation. Failure to do this in the present medical-legal climate is an invitation to disaster. Dermatologists biopsy common skin conditions only when there is a question as to the actual diagnosis, or when there is a meaningful differential diagnosis requiring exclusion. Biopsy is an expensive and invasive procedure that leaves a permanent scar. It should be done only when there are clear indications and there is a reasonable possibility that the test will provide worthwhile data. Performing skin biopsies to compensate for clinical inadequacies is inappropriate, costly, and not in the patient's best interest. As with any other test, the benefits depend on the skill of the practitioners who are involved. A skin biopsy must be adequately performed and the tissue should be examined by someone skilled in dermatopathology. Because dermatologists have extensive training in skin pathology, many read their own biopsy tissue, and their ability in this sphere exceeds that of most general pathologists. There are also dermatologists and pathologists who have a separate board certification in skin pathology. It is strongly recommended that skin biopsies be read by a person with special competency. Biopsy may be incisional or excisional. Incisional biopsy: Partial or incisional biopsies are performed to establish a diagnosis or to remove a lesion with a minimum of scarring while acquiring an adequate specimen to evaluate the histology. The four types of incisional biopsy are punch incision, shave incision, saucerization, and elliptical incision. 1. 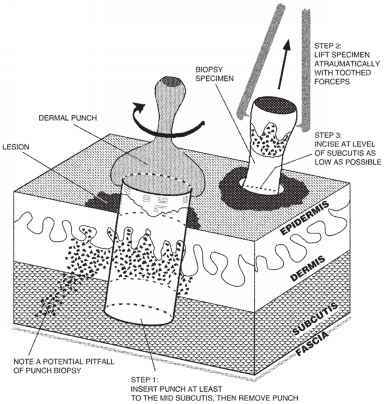 Punch incision biopsy: The most common type of skin biopsy performed. 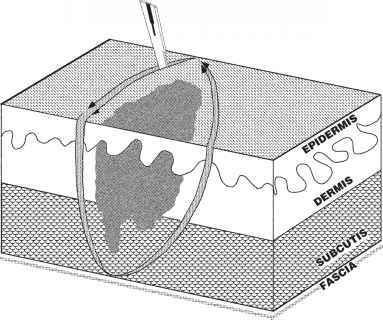 Under a local infiltration anesthetic, a dermal punch is applied and with a rotating motion the cutting edge is driven through the epidermis and dermis into the subcutaneous fat. The disk of skin is then atraumatically elevated with toothed forceps and is snipped as deep as possible at the base of the specimen. Cutting the disk superficially may miss the important histologic changes. 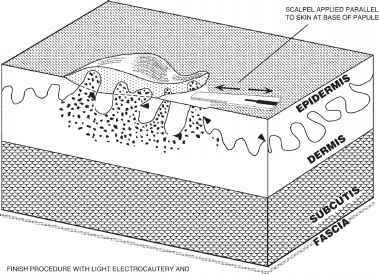 Hemostatis is then achieved by electro-cautery, aluminum chloride solution, Monsel's solution, or suturing (see Fig. 41). The size punch used depends on the site and the purpose of the biopsy. In cos-metically sensitive areas small 2- to 3-mm punches are preferred provided they are judged large enough to obtain the desired information. Larger specimens 4- to 8-mm in size may be needed to obtain enough tissue for the diagnosis of certain eruptions or when the intention is complete removal of a small lesion. Disposable elliptical punches in graded sizes are also available for removal of small benign lesions, which then allows the resulting wound to be sutured like a small elliptical excision. Suturing small punch biopsies of 2- to 3-mm is of no benefit and may accentuate scarring on the nasal skin. Suturing at other sites is at the discretion of the physician but is usually done when the punch is done for cosmetic removal of a benign lesion or when biopsying a cosmetically sensitive area. Figure 41: Punch incision biopsy. blister is usually best. If none are present, then a specimen from the interface at the edge of a blister should be taken. In an inflammatory disorder with papules, biopsy should include an intact papular area. With other inflammatory disorders, try to biopsy the most developed or infiltrated portion. 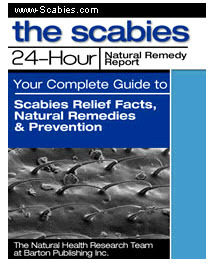 It is best to avoid necrotic, traumatized, crusted, or ulcerated sites, as these usually yield little information. Also try to avoid sites that have been modified by treatment. The specimen is then placed in fixative and is submitted with a careful description of the anatomic site and the lesion from which it was taken. Because punch biopsy usually obtains only a partial specimen, the limitations of the technique must be kept in mind. For instance, this type of biopsy is not recommended for the diagnosis of melanoma because the small specimen may not be representative of the full depth of invasion just a few millimeters away. Common basal cell cancers often have skip areas. If a biopsy is negative on a very suspect lesion, a repeat biopsy should be done. 2. Shave incision biopsy: A superficial partial removal that is done by literally shaving the lesion flush with the adjacent epidermis and is completed by very gently blending the edges with light electrocautery and a sharp dermal or ear curette. This type of biopsy is reserved for raised, presumably benign lesions occurring on sites that are cosmetically sensitive. GENTLE BLENDING OF THE EDGES WITH A SHARP CURETTE. Figure 42: Shave incision biopsy of a benign papular lesion. Shave biopsy should be avoided on suspect melanomas or common skin cancers. The procedure destroys the interface at the base of the tumor and interferes with depth staging, which is critical in treating a melanoma. In common tumors, it obscures the lateral margins, making definitive excision margins more difficult to judge (see Fig. 42). 3. Saucerization biopsy: A technique used by some dermatologists to remove pigmented lesions for evaluation. 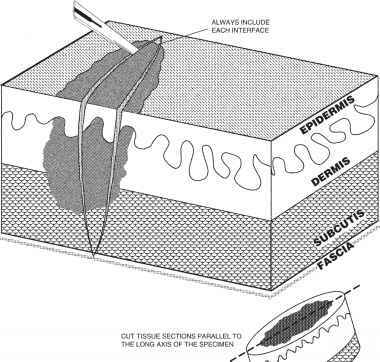 It is basically a shave biopsy that is carried into the dermis to the depth of the dermal subcutaneous interface. This technique should be discouraged. Not only is there the risk of missing or destroying important histology, but the procedure also usually leaves wide, unattractive scars (see Fig. 43). 4. Elliptical incision biopsy: Performed to obtain a representative section of a lesion that cannot be easily biopsied by complete excision. This may be indicated by the lesion's large size or because it is in a critical anatomic location. It should be considered when the practitioner finds or expects a punch biopsy to be inadequate. This type of biopsy is performed by taking an ellipse 2 to 3 mm wide across the center of the lesion from one interface to the other. The specimen should extend well into the subcutaneous tissue, preferably to the superficial fascia. Closure is accomplished with suture. The specimen should then be sectioned parallel to its long axis and read (see Fig. 44). 2. Ankle and pretibial areas, especially when there is an established circulatory disorder. 3. Shoulder, upper arm, upper chest, and back, which are areas of thick scarring. Figure 43: Saucerization biopsy of a pigmented nevus. 3. Midline lesions of the face and scalp. 4. Scalp lesions that overlie suture lines or fontanels, are by history congenital, or occur at a site of cranial trauma or surgery. 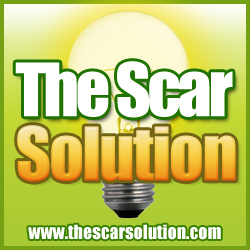 Excisional biopsy: Performed whenever the patient desires removal of the lesion and the scar is an acceptable tradeoff. This is also the preferred method of biopsy for suspect pigmented lesions where melanoma enters into the differential diagnosis. The margins of the excision are determined by the site and the nature of the lesion removed, but should be generous enough to accomplish complete removal (see Fig. 45). Answer: KOH examination should be performed when you suspect a yeast infection such as tinea versicolor (Pityrosporum obiculare) or monilia (Candida species). When combined with physical findings, a positive test is diagnostic. If a KOH examination of this patient reveals short plump, non-branched hyphae and clusters of round spores, this would confirm a diagnosis of tinea versicolor. The pigmentary change in this disorder resolves with adequate treatment of the yeast infection. Answer: No. A Tzanck preparation is used primarily to diagnose herpetic skin infections. 3. Would biopsy be of any value for this patient, and if so, why? Answer: If the patient has a repeatedly negative KOH exam and has not recently received any effective treatment for tinea versicolor, biopsy may be indicated. In this rare circumstance, the decision regarding biopsy and special pigment stains should be made by a dermatologic consultant. Answer: A KOH examination should be performed on a sample from the active margin of the lesion. If this is tinea pedis, KOH examination is an inexpensive and noninvasive test. A positive examination that shows long branching hyphae would confirm the presence of a dermatophyte fungal infection. Answer: If the KOH examination is negative, biopsy would be indicated for this patient. The biopsy specimen should be taken from the thready advancing margin. Biopsy in this case may show a superficial spreading basal cell carcinoma, in situ squamous cell carcinoma (Bowen's disease), or a subacute eczema.